Highlands Architect designed mansion: 6,113 heated sf, 7,844 sf gross. 4BR/4-1/2 Ba, 2CarGar. A wonderful formal house and plan for those who prefer more separate spaces in their home. Highlands Architect, Rand Soellner, ArCH, NCARB, designs luxurious mansions and cozy cottages in the Highlands area for a variety of clients. Some people want their aging residence renovated. Others what a new sprawling castle. Whatever the desire is, this architectural firm designs to suit their needs. Main level: 3,494 sf heated. There is an oversize Master Suite with the Master Bedroom 1, Walk-In Closet 1, palatial Master Bath with His & Her vanities, large central whirlpool tub, large windows to views outside, Master Study. Large formal entry Foyer, large Kitchen with oversize granite island with Keeping Room and Breakfast area open to Kitchen, Grand Hall (living area) with room for baby grand piano, Dining alcove that projects out as a bay with a turret roof, large stone fireplace, Outdoor Living Room, 2 car oversize garage, entry porch-bridge, exterior waterfall feature around the entry side and around house to the rear terrace level at a waterfall splash pool. Rand Soellner is a Highlands architect providing residential design for projects in Highlands, NC and other regions. 2nd Floor: 1,738 sf heated. 3 bedroom suites, each with private bathroom and walk-in closets. One can be used as a multiple bunkroom. Loft area has been enclosed as an exercise room, but this could be opened to be an exposed loft with railing. The largest 2nd floor bedroom is over the Garage. Drawing status: the home architects completed the Construction documents. This house has been built in Highlands, NC. Being a Highlands architect carries with it certain expectations. 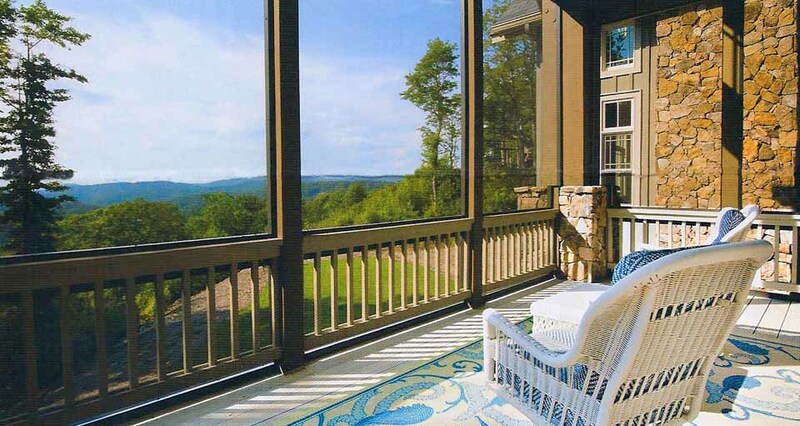 Great long range views captured by this Highlands architect from this home’s sleeping porch. (C)Copyright 2004-2010 Rand Soellner. A Highlands architect knows that the house designs here are part art, part technology. There are both aesthetic and technical aspects to living and designing in this place. It can be unforgiving. Soellner learned from the local structural engineers about how to properly secure a mountain home’s foundations to the granite bedrock. Doing this correctly insures stability. Not doing it can spell disaster. The pricetag for doing it right, perhaps a couple thousand dollars. The price for not doing it: potentially millions. A Highlands architect knows to spend a little bit where you need to in order to prevent serious problems later. Knowing these things can spell all the difference between a homeowner’s enjoyment or issues. Soellner home architects like things peaceful when it comes to the stability of houses. Some neighborhoods, like Ravenel Ridge, require your Highlands architect to design according to certain styles. Many neighborhoods in estate-class housing have architectural restrictions and stylistic requirements. Where this particular house was built, Ravenel Ridge, one of the nicest upscale communities in the town, there was a requirement for Arts and Crafts style architecture. The design was approved by the leading people of the homeowner’s association swiftly. So much so, that the project is now referred to as the Arts and Crafts Masterpiece. As a Highlands architect, Soellner regards this as an honor. Soellner functions as a Highlands architect, a Cashiers architect and on projects all over the USA and the World.